How do we determine the age of documents? Note: What is unusual about the two laboratory methods of dating is how they are being used. Carbon-14 dating is used to measure the age of objects thought to be thousands of years old, whereas the radiometric methods are used to date everything thought to be in the millions of years. Partly that is because radiometric methods are very inaccurate. It has even read living snails to be thousands of years old. What is curious about the carbon-14 method is that nothing has ever measured older than about 55,000 years. Is that due to some as yet unknown property of carbon, or do we live on a planet much younger than most say? "When one conception of God has ceased to have meaning or relevance, it has been quietly discarded and replaced by a new theology. A fundamentalist would deny this, since fundamentalism is antihistorical:"
3.1 Why do we need to know the age? The examination of the documents that translate into the Bible begins with the determination of their age. 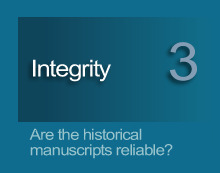 Knowing the approximate age of the writings helps put the writings into historical context. This will help clarify the finer points of their meaning as well as gauge the veracity of their prophecies. Obviously no one is going to find any date on an ancient document followed by a big "BC". Therefore, other methods must be used to accurately place these in time. 3.2 Isn't it as simple as checking ancient calendars? Consider the peculiar problems found in dating texts from ancient calendars. One problem is that different cultures used different calendars, and no single culture even maintained the same calendar. Another problem is that ancient cultures largely did not date their years of existence from any common point (like western nations today use BC and AD, or BCE and CE). Many ancient cultures marked themselves as relative to a particular monarch's reign. To coordinate chronologies between those cultures, we must note the length of reign of different rulers and then chart cross-cultural events such as wars, treaties, earthquakes, or comets, relative to the number of years into or out of a particular reign. This is a workable solution, but is complicated by the fact that different cultures also used different methods of recording the years of a monarch's reign. These regnal years could be dated from when a new ruler was named, or when a new ruler began to co-reign with an existing ruler, or when a ruler actually assumed the throne, or at the beginning of the first year after a ruler had come to power. Because ancient dating is mostly limited to these kinds of associations, accuracy is somewhat relative to an ever-sliding scale of when a handful of major events are best determined to have taken place. Further complicating this is the problem of incomplete archaeology. Archaeology, as we recognize it today, is a comparatively young science. With each of the many new archaeological finds being made come adjustments to previous theories and relative placements in time. 3.3 The turbulent history of establishing ancient dates. As has been observed above, the association of Amraphel, king of Shinar (Gen. 14:1), with Hammurabi of Babylon led scholars in the first two decades of the twentieth century to assign Hammurabi to a period as early as 2123-2081 BC. Thureau-Dangin reduced the dating by more than half a century to ca. 2003-1961 BC, Pirot brought it still lower to ca. 1947-1905 BC. And on and on the process of dating goes, illustrating that the more ancient the document, the more imprecise and relative any assignable date. Conversely, the later the event or writing, the more precise the date assigned. One additional difficulty in dating the biblical writings is that none of the original documents, as penned by the hand of the original authors (called autographs or autographa), is known to still exist. The biblical writings were actively used in teaching and worship, and as such, were subject to wearing out. The fact that copies were made is typical of document preservation in ancient times. Just how atypical the copying process was concerning documents believed directly inspired by God is the focus of another chapter. Having introduced some of the challenges in dating writings, what follows are methods which are currently being used in combination to arrive at the most likely answers. 3.4 What are the current methods being employed? 1. Simple study of the content of a text sometimes reveals its authorship and date. One author of a commentary on Habbukuk mentions certain events current to his own time. These could place the commentary's origin at the time of the Roman capture of Palestine under Pompey in 63 BC. Customs and other practices of life are another way to gain insight as to when a text was written. Also to be taken into account are details within a text which are no longer available, such as fine descriptions of cities and structures which have long since been destroyed. Those who approach biblical writings with the presupposition that prophecy is impossible sometimes use prophecy as proof of a late date. Some critics in the Enlightenment period who recognized the prophecy of Christ's atonement in Isaiah chapter fifty-three, for example, assigned the book to a date as late as the Middle Ages. However, that assignment was based upon a preconceived rejection of the text's contents rather than on historical or literary grounds. 2. Linguistic peculiarities may also offer insight into when and by whom a text was written. The style, the particular words or phrases chosen, and specific topics for which detail is provided or emphasis is given tend to indicate the authors' background and the general period in history. If God was referred to as Elohim in one passage, for example, and then as Yahweh the next, the conclusion drawn by critics seeking proof of multiple authorship was that each of these sentences evidenced the preference of different authors. (This theory will be further discussed in here; and predominant philosophies of the 18th and 19th century here.) But by that standard, even the original content of this site would fail to confirm myself as the sole writer. This is because I have referred to God as Lord, Creator, and many other titles. 3. Paleography, the study of ancient handwriting, is a comparative method of dating that can be used to discover the date of manuscripts or to corroborate the witness of other dating methods. William F. Albright and John C. Trevor came to separate but identical conclusions on paleographic studies of some of the Dead Sea Scrolls. They both place the writings to have been done as early as 200 BC. 4. Archaeology provides more clues as to when copies of Scripture were written. The pottery in which the Dead Sea Scrolls were left undisturbed date from late Hellenistic and early Roman periods of 200 BC to AD 100. More specifically, excavations at Qumran have revealed the general period of occupation was from 135 BC to AD 68, when Rome crushed the Zealot revolt. 5. Carbon-14 dating is another dating process. It compares the decay of carbon atoms within an object against a known rate of change. A linen cloth in which certain scrolls were preserved gives a date of 250 BC. A different method of laboratory dating is radiometric analysis. This measures extremely minute changes in radioactive decay, and multiplies that change by a rather enormous amount to arrive at an estimate. Unfortunately, the error factor involved can be equally enormous (more). Materials in this situation have the potential to become contaminated more easily and give false readings. While that will always be a consideration, the technology behind this method is not without some merit and might improve in the future. 6. Reference by other, later writings can also help to establish the date of preceding material. An Alexandrian Jewish philosopher named Aristobulus, writing between 170-150 BC, recorded that the Torah, or first five books of the Old Testament, were translated into Greek during the reign of Ptolemy II (285-247 BC). This translation was called the Septuagint (or LXX) to which translations of the rest of the Old Testament were later added. The LXX was fully complete by, or prior to, 117 BC. 5 No light is shed upon the dates of the original writings by the LXX, but Aristobulus' comments establish the importance and widespread demand of these writings very early in history. All too frequently the tendency has been to regard any biblical statement as unreliable and suspect, though the very antiquity of the Old Testament (even by the critics' own dating) should commend it for consideration as an archaeological document. In case of any discrepancy with a pagan document, even one of a later age, the heathen source has been automatically given the preference as a historical witness. An alternative to extra-biblical confirmation, surprisingly to many people, is what could be called intra-biblical confirmation. The various biblical writings can, to a great extent, be used to corroborate each other. This is because the Bible is not one book; it consists of separate works, by separate authors, from separate centuries. For example, it is not erroneous to use Daniel's writing to corroborate Jeremiah's, or Paul's to corroborate Isaiah's, even though they are all found within the compilation called the Bible. This is identical to using Copernicus to corroborate Galileo, or Hawking to corroborate Einstein when the writings of each are printed within the covers of the same textbook. Thoughts of key individuals from different eras expressing common beliefs within a single volume are not suggestive of collusion, but are indicative and expectedly descriptive of independent corroboration and confirmation. Extra-biblical confirmation of statements contained within the Bible is certainly welcome, but it is by no means a prerequisite for accepting the truth of any particular scriptural statement. Extra-biblical material is no less subject to the factors of bias and interpretation than is the Bible. Remember that space flight was as much confirmation for Yuri Gagarin that there is no God as it was confirmation for Apollo XVI's Charles Duke that there is. Similarly, the dating of Scripture will undoubtedly always continue to be as debated and contested as belief in God is itself. NEXT: When were the biblical books written? Establishing the integrity of the biblical texts begins with determining their age. Determining their age begins with identifying methods which are capable of revealing such information. 1. Why know the age? 2. How complicated is it? 3. Example of fixing a date. 4. What methods are used?